Rotational head movements cause the fluid in the cupula of the semicircular canal to "bend" the hair cells. 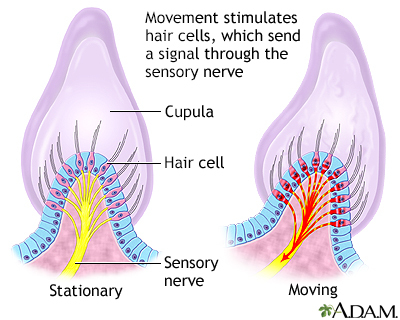 The hair cells, in turn, send a signal to your brain that you are experiencing "motion". Vertigo can occur when these hair cells are still sending signals of motion, even though you may be perfectly still, giving you the "illusion of movement".